Hey I was up early this morning with Jasper our Lab and while he was doing what dog's do... I was having a coffee and mooching around the computer and found the new Craft Barn alpha -dictionary challenge for this fortnight .... A is for.... Arches. I chose this because I recently bought Sheena Douglass' beautiful Arches stamp. Background was made using Vintage photo, Rusty hinge, Wild honey and Barn door distress inks smudged randomly then I stamped my arches on with versafine ink... a wet brush was then used to take out some of the colour in lines .. when blotted with kitchen towel it hopefully gives the effect of light coming in through left hand window. words, ancient, atmospheric & arches were added freehand. I had to think a bit harder about the second page, and as I was hoovering I remembered some photos I had taken of two bridges within 5 minutes walk of where I live. The most famous one is Thomas Telford's Menai Suspension Bridge built in 1826 it connects the island of Anglesey with mainland Wales , and the second one is Robert Stephenson's Britannia Bridge, originally when it was built in 1845 to carry trains it was just a tube supported by pillars but after a fire in 1970's they added a new roadway and the arches to support it. Choosing a song title for this page was difficult only one I could think of was 'Underneath the Arches' an old 1940's song , I can just vaguely remember Flanagan & Allen singing it. When I googled for other suitable songs this was the one that came out first so I went with it. 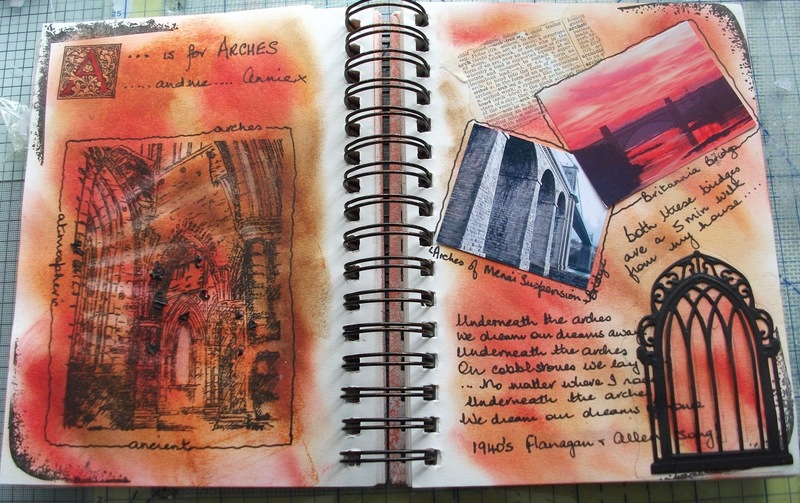 What a fabulous page... love the arch stamp, and your photos. Beautiful!! Love the colours on this and the arch stamp is great. Fab choice of word...Oooh I do love a Arch!! Beautiful 'A' pages. Great pages - love your stamping! A is for architecture too and maybe those arches are in an abbey!! I love that arches stamp! 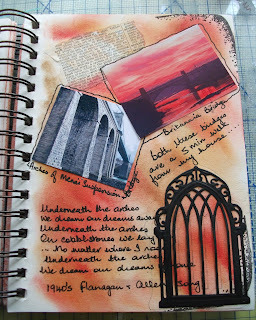 great pages, I also have photos of those two bridges taken on hols a couple of years ago. I like how you put the wording of the song on your page too. Lucky you to have such great views. Love the background colours. That is a beautiful stamp, and you've done it justice with your pages of art. Adding your arch photos is a bonus! Fab pages Annie, I love the colours. That arch stamp is wonderful. You captured the light rays beautifully, inspired work my lovely. Superbe pages! Love the arches! I love the effect of the light rays coming through the window...gorgeous. Great background colours allowing the black to really pop. 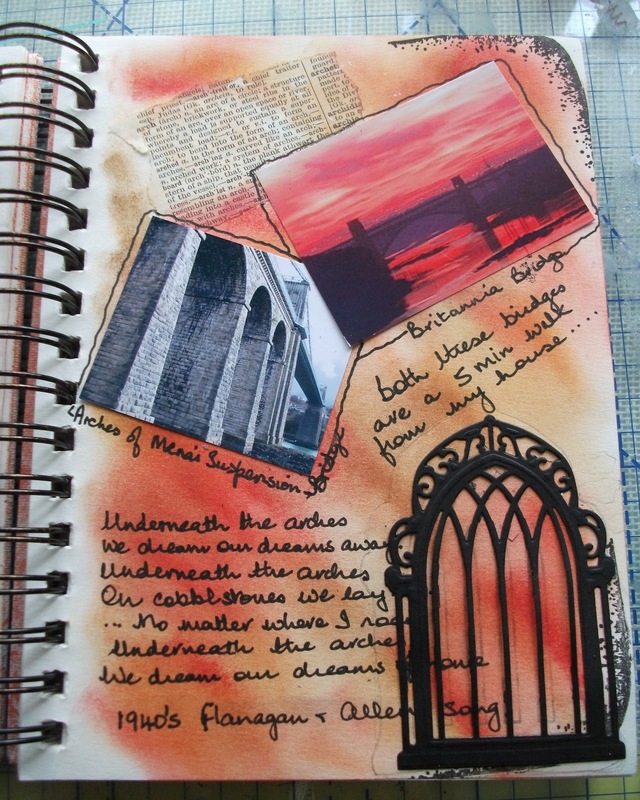 I like the inclusion of the photos of the bridges and the song lyrics. It makes it so much more personal. Lovely spread! 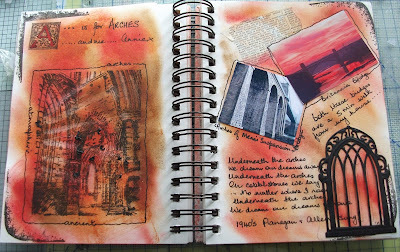 Fantastic pages, I love the arches. 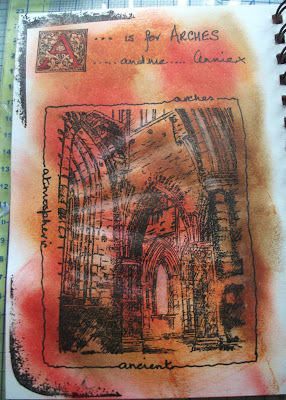 Fabulous arches, love the stamped Image with the rays of light, lovely co, ours too.